Sometimes when I start decorating a cupcake, I feel as though I'm back to being a little girl playing with Barbies. I can't help it. I always tend to get sort of carried away. You see- these little cuties were made and decorated the same day these little guys were. So here I am, placing ever so gently the prettiest pink bow at the perfect angle on top of half the cupcakes while gathering and placing tiny edible mustaches and bow ties on top the other half. Then after taking a step back to admire my work, it hit me- these are my adult version of Barbie dolls. Crap. Even scarier? I was instantly giddy and excited to set them up and adjust mustaches, bow ties, and pink bows. Just send me to the loony bin now. I blame it on the absence of outdoor activities and fresh air. I solely blame it on the fact I've been couped in the house for far too long doing orders...surrounded by too much sugar...and pink...and bows...and such. If ever two cupcakes were to be in love and married...it would be these two. They are the Barbie and Ken of cupcakes. Ahhh! Someone stop me! I instantly fell in love. This happens a lot with my sugary little ones. Almost every single thing I make...I just love! Not so much when they're just sitting there like losers on some parchment or tin foil. But GEE WHIZ as soon as they sit atop a cupcake and do their thing!? It's like ZING! I've been known to shoot pictures right away and blow up my husband's phone while he's at work with all sorts of weird angles and "just right" detail shots "just so he can really see what they look like". I've also been known to text him completely IN CAPS and a lot of "!!!!!" to really emphasize my excitement on how some cutie turned out. I then sit for what seems like days but is really mere seconds impatiently waiting his "Cute!" text message reply. Anywhooooooo... I better get going. <--- Uhhh what? It's not like we were actually conversing one on one... And even if we were I just totally was the rude friend (or worse the boyfriend who is waiting for the right time to call it quits with you). I want to be neither of those things! So it's been super fun boring you with my mundane and totally psychotic love of sugar, barbies, exclamation points, and what not. If you're still reading then RIGHT ON FRIEND! But alas my brain has completely embarrassed myself and I need to be done blogging STAT. ASAP. Sooooo...talk to you soon? Geez what am I saying... Uhhh...catch you later? WILL YOU STILL BE MY FRIEND?! Until we meet again, you will most likely find me huddled in a corner of a dark room, with only one light shining down on me from my nightstand- two cupcakes in hand and a Cupcake Dream House I just made out of cardboard and old Trader Joe's paper bags. Actually, they look more like Hello Kitty cupcakes! They very much do! That's what the original idea came from actually. 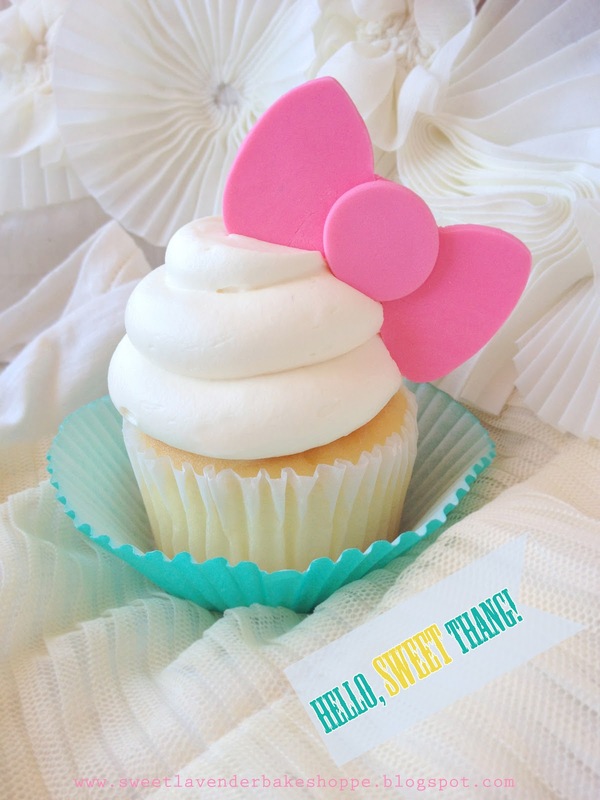 A long time ago I made a friend of mine Hello Kitty inspired cupcakes for her birthday ;) So, you're so right! Hilarious! You are so fun and quirky! Like Zooey Deschanel. Which by the way I can do a perfect impersonation of her. And my BFF tells me I could be her. Quirky is my middle name. Or Marie, whatevs! I LOVE the bows! Pretty!! Zooey Deschanel. We have a thing about her. Not a "thing" like "ooo la la"...but more...ok let me just explain. I LOVE her. I think she's super cute, pretty, sings well, dresses AMAZINGLY...biggest prettiest eyes...you get it. I like her a lot. Husband? Not so much. So whenever a song of hers comes on my iPod, or we see her on some show/movie it's his Zooey D imitation hour for the next day or so. I'd like to see you two compete in a Zooey D Imitation contest!!!! I'd pay to see that actually. Good times MUST be had there! I LOVE her too!! When I saw her in ELF as Jovie, it was true love forever! That voice... perfection!!! Well if I'm ever in California, along with meeting you and have some good times, there definitely will have to be a Zooey imitation contest! You are so stinking cute Christina!! I have an awesome visual of you playing with cupcakes in a dollhouse! haha!! And was this visual a good thing?? Did it make you happy? Because that very visual has been known to scare off small children as well. It made me SO happy. I adore you girl.